After following Deb Drager's artistry for many years, I finally had the pleasure of meeting her at a Faux Retreat she was teaching at in 2012. It was during the retreat when Deb told me about a foundation that she and Lynn Bandyk founded to, "Host fund-raising events, product Art-ful products and merchandise and provide educational experiences that will enable us to donate to ongoing research for cancer cure, reach out to families in "the fight' with gifts, creative workshops as well as support." In Deb's words, "The vision for Caring With Colors is to honor and celebrate our creative lives and survivorship by establishing a network of like-minded artisans to join in our journey to GIVE back." This past week we just wrapped up our first Caring With Colors - Faux Retreat. 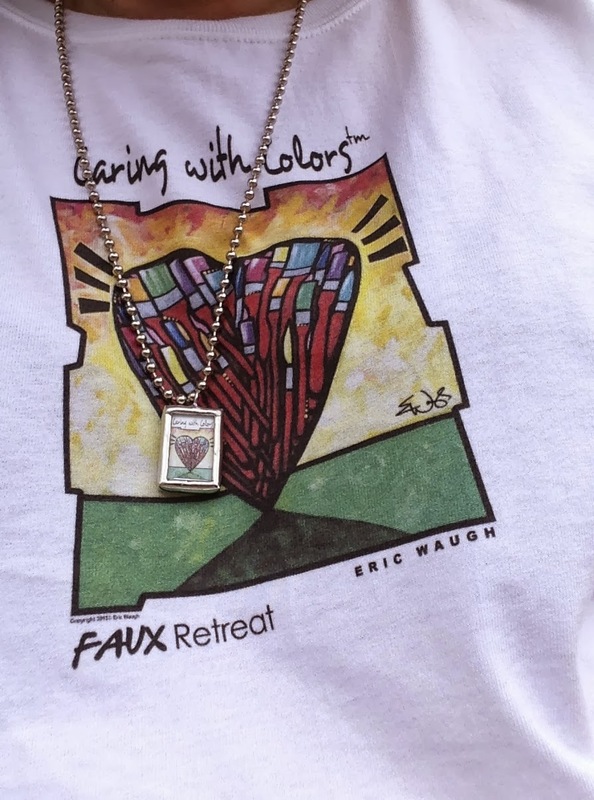 This retreat, held in Wichita, Kansas was arranged to "kick start" Caring With Colors and to raise money for the Caring foundation. I would not be exaggerating to say that something magical seemed to happen at this retreat. It was a time of bonding, laughter and healing for many, as well as the beautiful new art that was created during this retreat. On September 22, the first Caring With Colors Art Event was held in the artsy downtown district at Loft101. Artists from all over the country submitted works of art to be sold at the event. Artists were able to make money selling their artistic creations with a portion of their proceeds going to the Caring With Colors foundation, and many donated their art. We saw beautiful canvas and mixed media art, jewelry, furniture, glass and pottery. This event which was pulled together mainly by Deb Drager was a huge success! There is not one of us on earth who has not been touched by cancer in some way. Be it a parent, child, neighbor, friend or yourself, we all know someone who has had cancer. Cancer is a horrible disease that can strike in an instant. Suffering from cancer can be frightening, lonely and debilitating, to name a few. Caring With Colors wants to help and ART heals in so many ways. -Promote Caring With Colors on your website, blog and social media pages. -Start a Caring With Colors group in your city. -Sponsor a Caring With Colors retreat. Caring With Colors will be looking for art to add to the Caring Card and merchandise line. They will be asking fellow artisans to send creations inspired by the "fight", the "cure" healing, coping, hurting emotions when dealing with cancer. It not only affects the patient, it touches the family and the healing community. Eric Waugh (www.ericwaugh.com) is the artist who designed the Caring With Colors shirts for the Art Event. You can purchase the shirts and other merchandise at www.cafepress.com/caringwithcolors All proceeds go to the Caring With Colors Foundation. Caring with colors sounds like a lot of fun. Is it only held in Kansas?? The plan is to have them in different states to showcase artists from all areas of the country and also instructors.